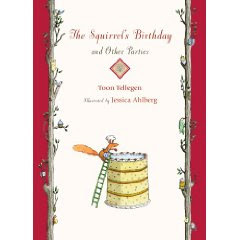 The Squirrel's Birthday and Other Parties by Toon Tellegen. Illustrated by Jessica Ahlberg. Boxer Books. September 2009. Reviewed from ARC from publisher. The Plot: A collection of short stories about animals, squirrel, ant, whale and others in a Wood, in the Ocean. The Good: Simple stories with the logic of childhood. Squirrel has a birthday; he invites people by writing invitations on beech bark. The wind delivers the invitations and the acceptances. Squirrel bakes cakes for those invited: He baked a rough bark cake for the elephant and a small, moldy willow cake for the woodworm. He thought deeply and then baked a cake made only of water for the dragonfly. It was a strange, gleaming cake and he put it to one side under the twigs of the rosebush. Everyone comes to the party and eats their cakes, gives presents, and then, of course, they dance. The other stories are equally fun and full of whimsy; a whale who hides in the Ocean but comes to a party on the beach and dances; a snail who builds a second story to his home. Things that make perfect sense to a child. 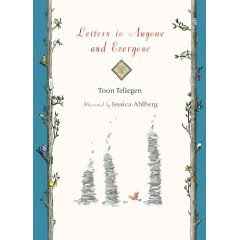 Letters to Anyone and Everyone by Toon Tellegen. Illustrated by Jessica Ahlberg. Boxer Books. November 2009. Reviewed from ARC from publisher. The Plot: Animals write letters to each other. And to tables. And to themselves. And the sun. The Good: The short, semi-intertwined stories continue. The stories and language are magical: "But the squirrel and letter noticed nothing of that. They slept and dreamed of words and sweet ink." The ideas behind them continue to be inventing, entertaining, serious. The tortoise wakes up one morning in a hurry and doesn't know what to do to stop being in a hurry. The elephant keeps climbing trees and falling. Parties are had, cakes are eaten. While these books will work best as a read-aloud, one on one with a young child, these will also make some learning-to-read young readers very happy. Those readers who like small books, the rich feel of the paper, and the quasi fantasy world where bees have shops that sell things for a fortune and memories can be kept in a box. Take a peak for yourself and see Boxer Books' website and illustrations from both books. Ahlberg's illustrations have details to pore over; something small to be discovered on each page. I am so getting these for my small animal loving six year old. They sound wonderful. They are just so cute in the best sense of the word. And also so bizarre. I went with the dates on the advance reading copies; it may be wrong, because I also saw October on some websites. Ah, the joy of figuring out release dates for the Cybils. I still have nightmares. Must eat ice cream to overcome them.